Originally from Calgary, Alberta, Canada, bassist Chris Tarry has firmly established himself amongst his contemporaries as both an award-winning leader and a sideman on a global scale. Over the past decade, Tarry has appeared on a collection of recordings with artists that span a wide range of musical genres and has participated in tours extending from one end of North America to the other and abroad. With the Canadian jazz quartet Metalwood, the first jazz group in Canada to be signed to the Verve Music Group, Tarry has been the recipient of a number of distinguished awards including the Juno Award (the Canadian Grammy) in 1998 and 1999 for "Contemporary Jazz Album Of The Year" along with multiple West Coast Music Awards for "Jazz Album Of The Year." Also among their long list of accolades, Metalwood has been acknowledged as a two-time winner of Jazz Report Magazine's "Electric Jazz Group Of The Year." As the leader of his own projects, which currently numbers six, Tarry has been nominated the "Bassist Of The Year" by Canadian Musician Magazine, "Best New Artist" for the Montreal Jazz Festival's Du Maurier Grand Jazz Award, "Bassist Of The Year" at the National Jazz Awards, "Musician Of The Year" from the West Coast Music Awards, and a "Contemporary Jazz Album Of The Year" Juno Award nomination for his solo endeavor, Of Battles Unknown Mysteries. 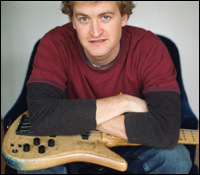 In 1995, Tarry received his Bachelor of Music Degree in Bass Performance from Berklee College of Music. Privately, Tarry has studied under the instruction of world-renowned jazz specialist Charlie Banacos as well as legendary bassists Gary Willis and John Patitucci. 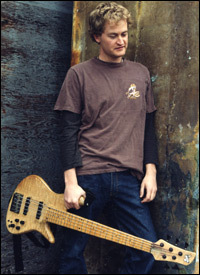 Utilizing years of teaching experience as a private instructor and touring clinician, Tarry self-published The Bass Players Companion - A Guide To Sound, Concepts And Technique For The Electric Bass in 2002. Before relocating to New York City in 2003, Tarry served as a faculty member in the prestigious Jazz Studies program at the Capilano College of Music in Vancouver, British Columbia. Today, Tarry maintains residence in Brooklyn, New York where his stock continues to rise as the frontman of his own group and in special performances alongside some of the best musicians the Big Apple has to offer. In this interview, Tarry chats with us about his early years growing up in Canada, the success he experienced as a member of Metalwood, directing his own groups, touring as a sideman, and trying to make a living as a bassist in New York City. I started playing bass in about 1987 while I was in high school. I had been playing saxophone in the stage band and wanted to start playing some of the rock music I was listening to at the time. I bought a guitar and joined a band with a bunch of friends called Molotov Cocktail. When I showed up to the first rehearsal, there were about 10 guitar players all with shiny, brand new guitars and no bass player so I decided if I was going to make this band and meet girls by being in that band, I better trade the guitar in for a bass. I took up the bass chair and was hooked right away, but I never did meet any of the girls. Which bassists have influenced your own approach to playing bass? That has kind of changed over time. At first, it was the rock guys like Duff McKagan, Jack Bruce, John Paul Jones, and even that guy from the band Tesla. I can't remember his name, but I got him to sign my bass once when they came through town. Then of course, like many others before me, I heard Jaco, and it was all over. Also, during that time, the players in Calgary, Alberta, Canada where I grew up were huge influences on exposing me to new players and approaches on the bass. My first teachers like Dale James and Rob Graham started introducing me to jazz and other kinds of music. I got into Rocco Prestia around this time as well. Later on while in school at Berklee, I really got into Gary Willis' playing and technique. I was also into Gary Peacock's approach to playing standards and wanted to make the electric bass function like that in a jazz setting. Steve Swallow was also a very big influence during this time. I started to get away from bass players as well. Keith Jarrett, Wayne Shorter, John Coltrane, and many others were very big influences. Pino Palladino and Anthony Jackson were on the list back then too. Lately, when I have time, I've been checking out some of the old funk and R&B sounds including the Meters, old blues stuff, and lots of modern pop/rock music. I'm just a little more interested these days in playing some solid, interesting, and appropriate parts in all types of music. It's a life-long study. 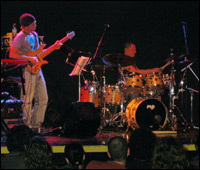 Having been awarded a number of prestigious honors including two Canadian Juno Awards as well as being signed to a major record label, your band, Metalwood, was one of the most well-established and successful electric jazz groups in Canada. Why relocate to New York City? There were a few reasons behind that decision. For one, the band had decided to take a break after recording nearly 8 albums in as many years. Secondly, I got a divorce so my personal life was up in the air to say the least. The third reason was that I received a grant from the Canadian government to move to New York for 5 months to study. I got here and gigs started coming in pretty early so I decided to stay. That was over two years ago, and I'm still here! What do you think contributed the most to the success of Metalwood? I think Metalwood was great because it was a band, one of those instrumental bands that had a strong member at every post and something to grab onto compositionally. It definitely became one of those classic "musician," bands, but normal people could dig it too so I think that had a lot to do with its success. Another way to put it is that some of the material passed "the girlfriend" test which was good for us. Still, the first four rows of every show were young musicians which is a fun group of people to play for. We all lived in different cities so a Metalwood tour or gig was a bit of an event. We never rehearsed so the "hey they're gettin' together again" vibe to every concert tended to draw a lot of people. Are you still playing with Metalwood? Metalwood seems to be on permanent hiatus, but we still get together about once a year to play in Toronto at the Rex. It's always great to hit it again with the guys, and of course, we don't rehearse. We just get up there, and it all seems to come flooding back. That band has such an amazing connection. You never know, we may get together to do another album sometime in the future. As a solo artist, you've assembled several projects as a leader including the Chris Tarry Group and Chris Tarry's Project 33. Can you tell us about these groups? They are all kind of the same band in that it's a band, whatever the name, that plays my music. Project 33 is a little more specific in that we play music from my last album called Project 33, and the members are kind of set. I write very open music in a lead sheet kind of format so it makes it easy to bring players in and out for a gig here or there, have them read the book, and see how the music changes. The Chris Tarry Group and Project 33 are one in the same. I should probably get the naming of the band thing together at some point, but at least the Chris Tarry part is consistent. If asked to describe your music to someone that is not familiar with your playing, does it tend to be bass-centric or rather feature bass more within a groove-oriented ensemble configuration? I kind of write a whole bunch of different ways. Some stuff is really jazz oriented, other stuff grooves, but it really depends on who is on the gig. One thing I always concentrate on is writing simple, memorable melodies. The bass part is often the last thing on my mind. With my own music, the bass tends to provide a simple foundation. I'm not a big fan of "bass-centric" albums. Most of the tunes I hear from those kinds of projects are so un-memorable. I like it when bass players dig my music, but let's face it, we're just one part of the band. I'd much rather hear a guy who I know can play the melody, chords, bass line, and piano solo all while standing on their head but choosing not to. Making those selfless decisions is what playing bass is about, and in the end, it's the hardest thing to learn. Where can viewers check out your playing and purchase your recordings? Please visit my website, ChrisTarry.com. Along with a bunch of mp3's, you'll find random postings, a CT store, a very up-to-date calendar, a nifty flash intro, pictures of Canada, and a preponderance of the color green. For the past couple years, you have toured as a member of The Mahavishnu Project performing the music of John McLaughlin and the Mahavishnu Orchestra. How did you become involved with that endeavor? When I moved to New York I played a session with an amazing guitarist named Pete McCann. He liked my playing and recommended me to Gregg Bendian, the leader of the Mahavishnu Project. I remember getting the call from Gregg, and he asked me if I was really familiar with the Mahavishnu music. I said "of course" because I was new to New York and really needed a gig. I honestly had no idea what I was getting myself into. I'm a bit younger than the other guys in the Mahavishnu Project, and Mahavishnu Orchestra was a little before my time so I had some serious catching up to do. I quickly collected every Mahavishnu album made and set to work on learning all of it. With the Mahavishnu Project, I really tried to retain the essence of what Rick Laird brought to the music while at the same time trying to infuse my modern influences to update the bass playing a little. I wanted to play the music as Rick would have played it had he been fortunate enough to experience all those that he had influenced. He was the first. He laid the ground work for the rest of us, and taught us to never forget the groove! Do you play as a sideman with any other bands? That's basically all I seem to be doing these days. Making a living here in New York is very high stress, and your range as a musician, if you want to make a living, has to be huge. Reading, jazz tunes, pop projects, society gigs, and the entire history of every kind of music needs to be at your fingertips. I have a bad memory so playing here is a lot of work for me. I may do a singer songwriter tour or something that is really specific and focused, get back to town, and all of a sudden it's a jazz gig, followed by an old school R&B gig, followed by a gig where you need to know every tune ever written. I find it REALLY hard to switch gears like that, but this town makes you work on being able to do that on a consistent basis. I'm still not that great at it, and like I said, I have a bad memory so I'm taking a lot of vitamins, drinking orange juice, doing head stands, and working out. Hopefully it will help. I'm playing a lot with groups like the Mahavishnu Project, the Jim Rotondi group, the Jay Collins Band, the amazing Leah Siegel band, and the Oz Noy Trio when filling in for Will Lee every now and then. Due to the fact that there are so many bass players available in New York City, was it difficult to find gigs when you first arrived there? I was really, really lucky. There were tough times at first and you question being here on almost a daily basis, but I was luckier than most. I got an off-Broadway show gig almost right when I got here so that helped. I had some money coming in, and the grant from the Canadian government helped a great deal. Before things started to take off a bit more, I did a bartending gig. It was the first non-bass job I had in about 15 years, but it was great and made me practice a lot! Being a part of Metalwood helped a lot because some people had heard of me. That helped get me a few nice gigs early on and get my name floating around the city in the smallest of ways. That led to some more recommendations, and the word just spread from that point. It's crazy though. Some months, as it is for everyone here, are still pretty slim, but somehow it always manages to work out. Now that you've experienced living and playing in both Canada and the United States, how would you compare their respective music scenes? I think there are amazing players everywhere whether in Canada, around the world, or your next door neighbor. The difference here is that there are more musicians in a highly-concentrated area. Although, I've played some of the worst music I've ever performed here in New York so the advantage of a lot of people can have a negative effect, too. I was fortunate in Canada to play with some of the very best, and that helped me grow in very specific ways. It's a small scene in Canada. Everyone knows everyone or has at least heard of them. Here, you're a little fish in a big pond. No matter how many people know your name, it's always a very, very big pond. Since you graduated from Berklee with a degree in bass performance and you've also studied privately with Charlie Banacos, Gary Willis, and John Patitucci, what were the biggest lessons you learned and took away from that instruction? With Charlie, I learned the importance of ear training. Some days I can hear a change coming 40 miles away, and other days I can't hear a door slam. I'm still trying to figure that one out, but maybe the vitamins will help. Gary is a great friend, and I learned a lot about technique and sound production on the bass from him. Patitucci is an amazing musician as well as a beautiful and supportive person. Along with musical stuff, he's inspired me to look into the more spiritual side of music, look within myself, and try to identify what it is I'm trying to say with this slab of wood. 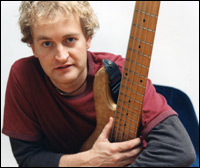 In 2002, you authored an instructional book titled The Bass Players Companion. How did this project come together and what is its focus? I wrote the book because at the time I was teaching a lot as a professor at Vancouver's Capilano College. It was just some idea's I'd worked with over the years. I wanted to help those players that could already play but were having a hard time putting the knowledge together on how to get better. It's a book of concepts. Sometimes concepts are better than actual "ok, now put your finger here and then there" kind of teaching. I tried to have the book show the student a path to becoming better, and once shown the path, the rest is up to the individual. I also tried to make it like taking a lesson with me which is casual and above all fun because if we don't have fun playing music, we may as well hang up our skates. Do you offer private lessons or conduct clinics, and if so, in which areas of bass playing do you focus the majority of your time in lessons? I've just started teaching privately again here in New York. I basically hand the student my book and leave the room. Seriously though, I try and figure out where each student is in their own development and work from there. I have been doing some clinics back home in Canada. I basically play, stand up with my arms crossed and say "any questions?" and then we all talk about moose, snow, hockey, and all things Canada. I'm using the new Aguilar AG 500 SC. It's amazing for truckin' around New York. It's light, flexible, and sounds terrific. They have been very good to ol' Chris Tarry down there at Aguilar, and they make fantastic stuff. I play an old Fodera Emperor 5-string that looks like it's been dragged behind a bus. Lately, I've been playing a lot of my 1969 P Bass as well. I have a Hozono 5-string fretless too, and I use GHS progressive strings. What's next for Chris Tarry in 2006? I'm trying to do a tour of China with my own band in February, and as soon as I figure out how to dial the phone to China, that should fall into place. Tours with the Jim Rotondi's band and the Oz Noy trio in Canada might be in the works. I'm going to do a new solo album by next summer, too. I have some new material, but I have to figure out the kind of band I want for it. Other than that, I'll keep on truckin' as they say. Hopefully, New York will continue to be nice to me. Do you hear me New York? Be nice!